In a Microwave world where everyone is looking for immediate satisfaction the computer system is not exempt. Faster processors, larger RAM, and faster broadband connections are a few examples of optimizing a computer’s potential. Years ago it was basically just Servers reaping the benefit of 64-bit processing, but today 64-bit processors have almost become common amongst desktop PCs. This advanced technology actually doubles the amount of data a CPU can process per clock cycle, essentially blowing the 32-bit chip out the water. In the past the trouble with making this 64-bit upgrade was that your 32-bit software would not work well, and you would need new drivers for all your existing hardware; drivers that may not yet be available. However the 64-bit software market has made tremendous strides now to the point where users can even find some quality 64-bit freeware applications. Although the drivers could still be an issue, just as long as you are using a newer computer it should not be a restriction. The basic requirements to run a 64-bit system pretty much consist of having a 64-bit chip like an AMD Athlon 64, Turion 64, or an Intel Core 2, or Pentium 4 processor. Also you will typically need 4GBs of memory because most 32-bit systems usually top out at around 3GBs of memory. Finally there are several Operating Systems available for potential 64-bit users. If you were not a fan of Vista, and are not ready to switch to Windows 7, it is not a problem; 64-bit Operating Systems include Windows 7 64-bit, Vista 64-bit, XP 64-bit, Mac OS X, etc. These are all basic specifications you should look for when purchasing a new computer, but if you are planning to upgrade an existing computer you could potentially need a few additional hardware changes. So is it worth the upgrade? Yes, simply because the transition is inevitable. Already many PC gamers, users of CAD, desktop publishing, and/or scientific software benefit from the 64-bit technology graphic enhancements. Just think digital television and blu-ray DVD players, because those are two examples of inevitable changes in technology where manufacturers decided to force change upon consumers. It’s time to be on the cutting edge. Everyone in the world needs to follow the example of the Canadian Pitstop populous and make the switch sooner than later. The 64-bit upgrade will start with the Desktop. Windows 7 continues the 64-bit transition. North Americans process information faster! 64-bit home use is supposed to increase faster than Business. Vista is extremely popular amongst 64-bit OS users! 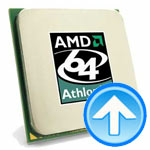 Research 64 bit processors, amd athlon 64, chip, clock cycle, computer, GBs, hardware, mac os x, technology, turion 64. permalink. The download speeds on your site were way off tonight on “Full tests”. I verified my download speed before and after doing the tests at 2 independant internet speed test site & it was 12.2 Mbps. I ran the full tests twice and your rating of my download speed was less than 9 Mbps. Something is definately off. How did you get your MP830 working on Win 7 64 Bit? Which drivers are you using? Yes, I agree the logic given for 4 gb is flawed. Addresses can be bigger with 64 bits, hence more memory can be used, but is not required. I can’t use my Palm Zire71 or my Xerox copier/printer with the new 64 bit computer. Are drivers really that hard to write? It’s because these are older peripherals that the makers don’t want to support any more. People didn’t upgrade to XP x64 SP3 because there was never one for XP x64, as that is based on windows 2003. Also 4GB of ram isn’t required for 64bit, but 32bit can only support up to about 4GB due to memory register addresses whilst 64bit can support much more. 64 bit drivers are not a requirement for running Canon printers on 64 bit operating systems. Our Canon MP830 runs fine with Win 7 64 bit. Windows 7 64 bit works very well on all 32 bit applications that I’ve tested so far, with the exception of some virtual drive software. The charts are a little confusing. What does attach rate mean? and is the number a percentage or what? The last chart claims Vista is popular among 64 bit OS users. What other OS is it compared to, the rarely factory installed XP64? Did the author mean that it was popular among users that had 64 bit processors? My Compaq desktop (about 4-5 years old) which I am still pretty happy with, has the AMD athlon 64 processor, but came with XP (naturally). Is this a 64 bit processor, and if so, why didn’t it come with XP64. Ive looked into upgrading to 64 bit XP, but the challenge of finding drivers etc. looked a little too daunting. Especially since Vista came into light, many software/hardware companies have probably stopped writing new drivers for XP. Will my current system run better with W7, provided I upgrade the memory to the 4 GB max? It currently only has 1gig pc3200 memory, would W7 run on just 2gig? I am currently running 7 RC 32bit but when I move to the full version I intend to use 64bit. XP 64bit was a horrible OS but the reason was nothing more than a lack of decent support. Today 64bit support is pretty much there and it’s time to make the transition. I agree with Billy! If Adobe doesn’t/can’t do it is time for competition to come up with one and put Adobe out of business. Hey, will somebody wake up Adobe Flash Player? 64-bit has been out for a long, long time now … plenty of time to develop a flash player. Bugs me to have to use the 32-bit browser in order to view videos on line. I had a 7 year old computer (Dell dim. 2350 desktop) I recently purchased a laptop with Vista 64 with the free Win 7 upgrade coming in October. I had a few items that didn’t do well with the new 64 bit system: my palm OS doesn’t support hot sync thru the USB with 64 bit, but bluetooth works fine, older version of corel draw didn’t want to work, scanjet 3970 flatbed scanner drivers non existant (but by accident found I can access my scanner abilities through Picasa 3). All in all I have been pleasantly surprised that my new computer is so fast and compatible on so many levels. There is a slight learning curve with Vista, but hey there was a learning curve with XP too! Shame that periferal suppliers like cannon do not supply drivers for 64bit systems which has left me with a perfectly good laser printer lying idle at the moment. I am on XP64 with a Canon LBP5100 Laser printer This is a problem anyone know the answer. Mac Pro not a Mac as Mac is like the PC all in one granted you will have better hardware in general then the PC but look at what you could get for $2000.00 and + because all the all in one are medium at doing everything and not good for gaming or intensive video editing, of course if you just want to do simple mail and simple video editing and chat, any all in one solution will do perfectly for that task (In fact XP will do that very well). You write “Finally there are several Operating Systems available for potential 64-bit users. If you were not a fan of Vista, and are not ready to switch to Windows 7, it is not a problem.” Dead right – simply get a Mac with 64-bit Snow Leopard. Windows 7 Pro is on its way to my PC in October and the 64 bit version is the intended installation. I have plenty of XP 32 bit applications that I can easily run on the 64 bit platform utilising “XP Mode”. I’m looking forward to the endeavor particularly since a new SSD is also ready for installation when W7 arrives.